Three seniors at the Academy of the Sacred Heart formally signed their intent to participate in athletics at the collegiate level on April 3. Katie Burvant will play tennis at Spring Hill College in Mobile, AL; Mary Nusloch will be part of the cross country and track & field teams at Rhodes College in Memphis, TN; and Addie Roemershauser will play soccer at The University of the South in Sewanee, TN. 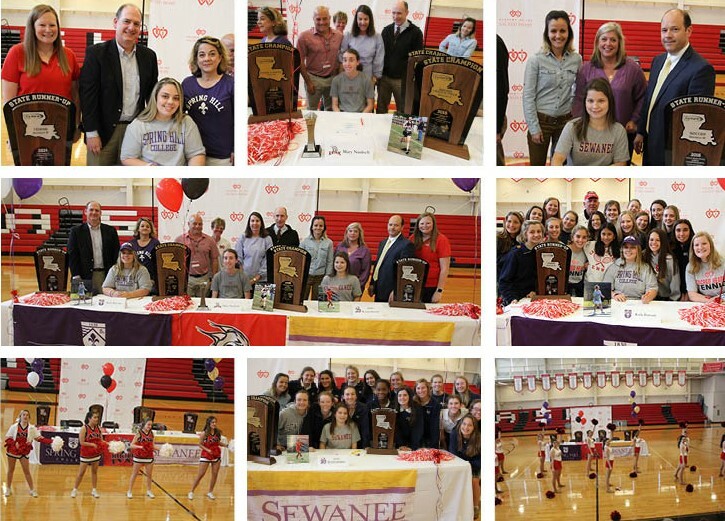 The three student-athletes were joined by their Sacred Heart coaches, families, and the entire Upper School to celebrate their decision to compete at the collegiate level. “We are honored to have three student-athletes be a part of the seven percent of high school students who continue to compete at the varsity level in college,” says Ashley Ruckert, Director of Athletics at Sacred Heart. Burvant is a five-year varsity tennis team member who has received both All-State and All-Region honors. During her Sacred Heart tennis career, she helped her team earn three regional titles, as well as a state runner-up title. Nusloch has earned an impressive number of accolades as a seven-year varsity cross country team member and a five-year track & field team member. She was part of six cross country state championship teams, two indoor track & field state championship teams, and Sacred Heart’s first-ever outdoor track & field state championship team in 2018. A 12-time individual state champion and five-time individual state runner-up, Nusloch is the first Sacred Heart athlete to be named Gatorade Louisiana Girls Cross Country Runner of the Year and to receive All-American honors in cross country, which she earned in 2017 and 2018. A four-year varsity soccer team member, Roemershauser was part of the state runner-up team in 2016. During her soccer career, she earned four All-State and three All-Metro accolades, as well as three District MVP awards. Roemershauser was also a 2019 East All-Star team member.